The L.A. Clippers announced on March 6 that they have assigned guard C.J. Wilcox to the Canton Charge of the NBA Development League pursuant to the Flexible Assignment System. This is the third Development League assignment for Wilcox this season. He has appeared in 15 games (14 starts), averaging 17.8 points, 4.1 rebounds and 2.9 assists with the Bakersfield Jam and the Charge this season. He has appeared in 13 games for the Clippers this season, averaging 1.5 points in 4.6 minutes of action. 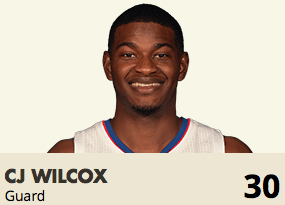 Wilcox appeared in 21 games last season for the Clippers, averaging 2.0 points and 0.4 assists in 4.8 minutes of play. During the 2015 Orlando Pro Summer League, he posted averages of 14.0 points, 3.2 rebounds, 1.6 assists and 1.4 steals in 32.0 minutes of play.